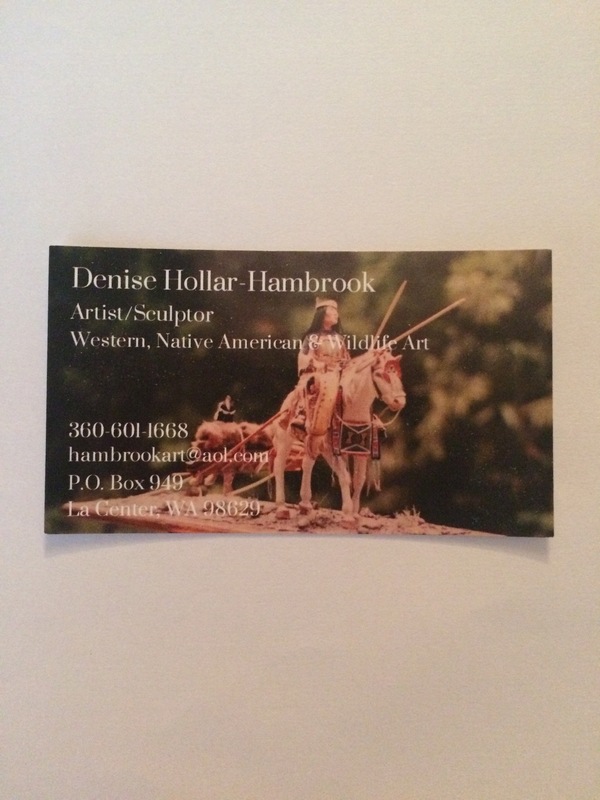 La Center, WA........Denise Hollar-Hambrook is a self-taught Artist/Sculptor with 25 years of experience. She has participated in numerous Western & Native American Art Shows and Art Auctions generating International Sales. Denise uses a wide range of media as she creates One-of-a-kind Sculptures, Oil Paintings, Cedar Carvings, and Beadwork in the style of the Plains Indians, geared for avid Art Collectors who demand Authenticity. Her specialty includes Hand painted Buffalo robes and Buffalo skulls with authentic Native American designs. One-of-a-kind Sculptures with Miniature beadwork on leather is created using rare 100 yr. old size 18 and size 24 Czechoslovakian Miniature, glass seed beads. Custom Log Home owners and hand paints rustic wood furniture, kitchen cabinets, and Hand carved Cedar Entry doors in relief. Denise has an intensely driven curiousity and an eager desire as an Artist/Sculptor to experiment with all phases of Art. She continues to expand her knowledge and gain expertise in the work she creates, never limiting herself to one style or medium. Her preference for extreme, fine intricate, detail, and realism, can be seen in each piece of Art she creates. Original-one-of-a-kind Art work that has been created by Denise, is displayed in private Art Collections from The Pacific Northwest to The Southwest.